We are entering the 3rd month of the year now, there are a few happenings, let me give you a quick update. I've started on my driving lessons. Auto is so much more easy than manual car. Enough said. I was really scared at first, but then I conquered my fear of handling huge heavy machine and yeah, I drove all the way around Donggongon and Putatan area. The other day, I met the President of SWEPA, president Wynnie, (it's pronounced just like my name) at a book launching event, she is a very nice lady. She invited me to a talk held by the organization. 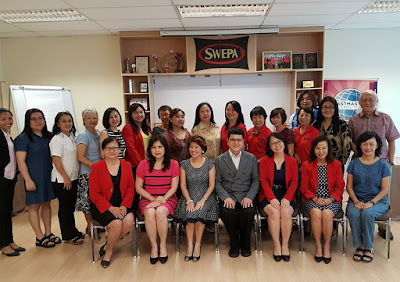 If you never heard of SWEPA, it is Sabah Women Entrepreneur and Professionals Association, an organization to help women in Sabah, quite self explanatory isn't it? So I attended this talk at Wisma Wanita last week. The talk was delivered by Dr. Oh Ei Sun, a former political secretary at Malaysia prime minister Office on the topic "Belt and Road Initiative". The topic was mainly about the relationship between China and Sabah both in business and culture. I gotta say, I felt dumb and brilliant at the same time after hearing the talk. I felt dumb cause I don't quite understand this unfamiliar topic. I felt brilliant cause I've learnt so much insightful never-heard-before information in 2 hours. And the most important part was, these wonderful women were able to give their own opinion on the issues discussed. Lesson of the day: Never underestimate the intelligence of women. They might surprised you with their wide and in-dept knowledge and English vocabulary. Man I felt even dumber now. It's time to read something out of my comfort zone. Oh, haven't I tell you guys, I picked up ballroom dancing and I have completely fallen in love with it.